James Nisbet of Highside, near Darvel, Ayrshire, was arrested and executed at Howgate Head on 5 June 1684. 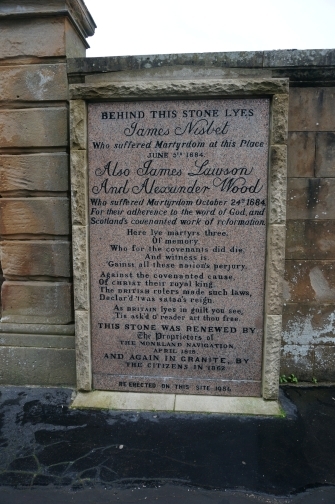 James Lawson and Alexander Wood were executed in Glasgow on 24 October 1684. 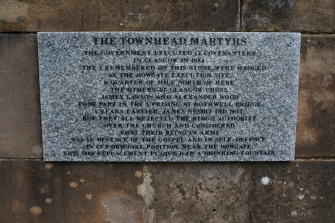 The Townhead Martyrs' Memorial is affixed to the boundary wall of Glasgow Evangelical Church. A more recent information stone is located alongside, shown to the right. The original memorial was erected in the seventeenth century and was located elsewhere in the district, but it has been moved around over the years. In April 1818 it was renewed by the Monkland Navigation. It was rebuilt again in 1862. It was incorporated in the Carlton Cinema, but when it was demolished it was built onto a motorway flyover. It was later located at the Martyrs' Church in St Mungo avenue before being relocated here.